The Captain’s Choice tournament will begin with registration and lunch at 11:00 am, followed by a shot-gun start at 12:00 noon. The tournament is limited to the first 120 golfers registered. 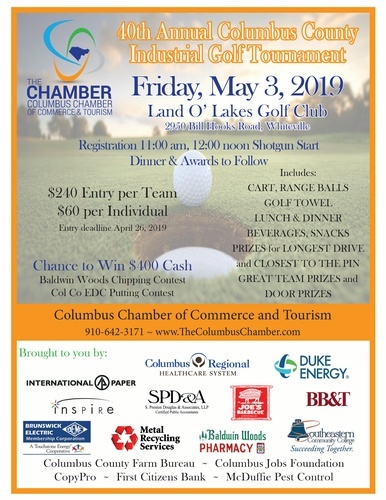 Golfers from across the area are invited to participate in the Annual Columbus County Industrial Golf Tournament, hosted by the Columbus Chamber of Commerce and Tourism. The entry deadline is Friday, April 26, 2019. Call the Columbus Chamber of Commerce and Tourism, 910-642-3171 or visit the website to register, www.TheColumbusChamber.com.